We recommend that you attend one of our sharpening courses. Perfect and gentle sharpening of knives, chisels , plane blades, carving blades using and so on. 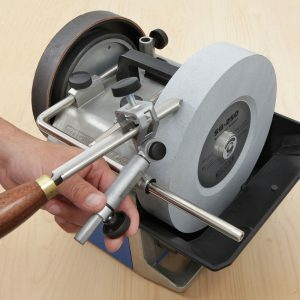 You will practice the sharpening by hand on waterstones and with abrasive-guided knife sharpening systems. Please bring along suitable tools for sharpening! We recommend sharpening high quality cutting steels by hand with waterstones, as this method has several advantages: It results in ultimate sharpness, it is gentle to the steel, you can do it anywhere, quickly, and at a low cost. You will learn how to perfectly sharpen your knives on water stones while preserving the blade. The course will also feature an introduction to specially developed knife sharpening systems such as the Sorby ProEdge or the Magna-Tec Delta-S, and you will be given the opportunity to test them yourself. 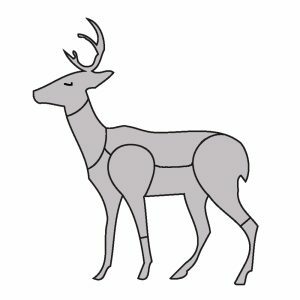 You will acquire background knowledge on steel and sharpness. Demanding exercises under professional guidance will help you achieve perfect results. Please bring your own knives along! All Tormek owners and those wishing to buy one now have the opportunity of getting to know their machine in detail. 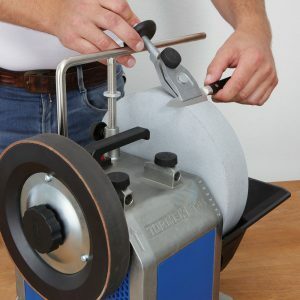 The course includes precise and gentle sharpening with the Tormek sharpening machine and a presentation of the various accessories for the Tormek system. There is one Tormek grinding machine available for each student! Please bring tools to be sharpened! If you buy a Tormek T-8 or T-4 from DICTUM you may take part in this course free of charge. Sharp tools are essential for successful carving. Carving and sculpting gouges in particular often have a complex blade geometry, for which only a few sharpening jigs are suitable. This makes sharpening very tricky and requires skill and know-how from the sharpener. In this course you will learn step by step the different techniques and all important aspects of sharpening carving and sculpting tools on both waterstones and machines. Turning puts a huge strain on the cutting edge, meaning the tool becomes blunt relatively quickly. Sharpening is therefore an important component of successful turning. The right cutting angle and the ideal grind contribute in no small way to a clean surface. During the course, you will learn how to sharpen tools by hand and using sharpening machines like the Tormek, the Sorby ProEdge or the circular saw grinding machine with precision and in a way that protects the tool. This includes learning how to create a reproducible polished section and a traditional or fingernail grind. Special grinds such as the Ellsworth Special Grind will also be covered. 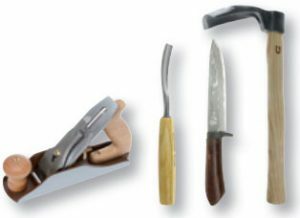 Participants will be shown how to sharpen gouges , chisels , parting tools, scrapers, ring tools and hook tools. The course is designed for both novices and experienced wood turners wishing to expand their skills. 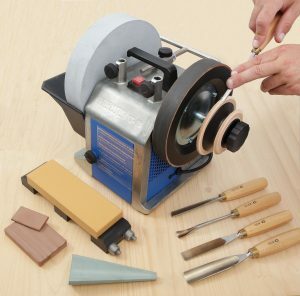 Please bring along suitable wood turning tools for sharpening! All tools, also kitchen tools, have to be very sharp in order to achieve optimum results. 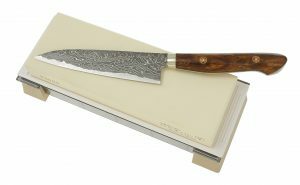 Well sharpened blades make cooking a joy, facilitate the work and increase the security while cutting. You will see and taste that the choice of ingredients is just as important as using sharp knives and kitchen utensils for visually appealing and aromatic dishes. 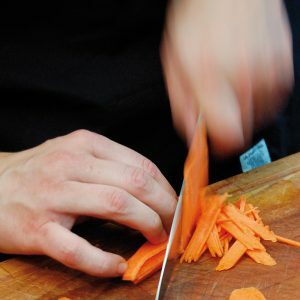 After sharpening your knives together with Zara Valenti you will try them in practice and conjure up a delicious menu. Spring:The menu includes as a starter tartar of arctic char with a Baby-Leaf-Salad on elder-marsala-dressing with caviare and edible flowers. You can try your recently sharpened knive by cooking some vegetable antipasti with air-dried premium ham, olives and buffalo mozzarella, braised side of veal with a creamy polenta and caramelised potato sticks. Baked apples from russet cut into cubes with freshly whipped zabaione complement the menu as a dessert. Autumn:As a starter you will cook a soup of celery and almond with grapes and celery mousse. The main dish, creamy mushrooms with dumpling and French Crème fraîche, braised beef with red wine and pomegranate with saffron risotto and gremolata, makes it possible to use your recently sharpened knives. As a dessert you will enjoy a Black Forest chocolate cream with sour cherries. Students have the option of staying overnight in the idyllically located guesthouse Wild-Berghof Buchet. Practice in handling the straight razor, the perfect shave with the blade, sharpening of the straight razor with Japanese waterstones, stropping it on the leather, caring for your straight razor, and background information about wetshaving. Participants must bring a straight razor (can also be purchased before the course begins).